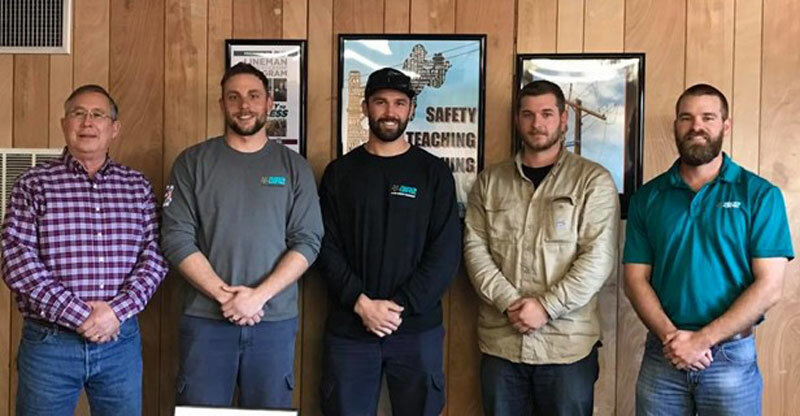 Congratulations to the three Air2 employees who successfully completed 576 hours of classroom study as part of the PLH Group Apprenticeship Program. This accomplishment marks the fulfillment of the first segment of the challenging four-year electrical lineman program. The remaining portion, which is currently underway, consist of 8,000 hours of dedicated on-the-job training. Upon graduation, these Journeyman candidates will receive the highly coveted U.S. Department of Labor Journeyman Certification. Areas of specific training for the Air2 Journeyman candidates include elevated work procedures, high voltage transmission line construction and maintenance, transformer installation and repair, rigging, high voltage transmission line splicing, electric substation construction, underground work, hotline (also called bare-hand or live-line) work, and crew leadership. Every aspect of training includes a specific safety and protection component. Apprentices have tremendous support from PLH Group headquarters. Kathy Williamson, Director of Apprenticeships, provides logistical, emotional, and moral support during the four-year program. She works with the linemen throughout the duration of the program, ensuring they log hours, attend classes, finish required training, and are adequately prepared for the rigorous tests.